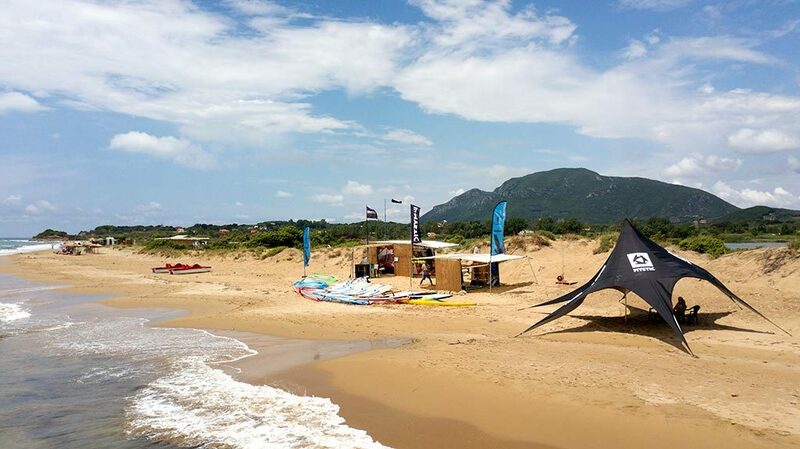 Surf Center Corfu is the perfect place to learn to windsurf, because it is located in a nature reserve where annoying powered boats and jetskis are not allowed. Hence, the student can concentrate on learning and not worry about boats. The beach gently slopes into the Ionian Sea givings us a beautiful standing area near the shore, which makes learning to windsurf a lot easier. Our spot has plenty of room to learn with a large shallow area with a forgiving sandy floor. Right next to our station there is a kiosk, here are small snacks and drinks offered. After our spot is located in a nature reserve, there are no hotels / guesthouses in the immediate vicinity. The town of Agios Georgios South is about 5 km away. Here you will find everything you need for a perfect holiday. Overnight accommodations (for example, www.korfu-ferienhaus.de) super markets, which are open until midnight, a variety of taverns, car or scooter rentals, medical care, ATM etc. The weather in Corfu is virtually free of rain during the summer months. The average temperature is around 35 celsius degrees. Simply perfect for water sports!